During the past three and half decades, various governments at the centre introduced several crop insurance schemes for the farmers to lessen the risks (partial or full) involved due to natural calamities and crop diseases. In 1985, in its very first attempt, the Government of India (GoI) launched Comprehensive Crop Insurance Scheme (CCIS) with a mandate to a national coverage. In 1999, CCIS was replaced with a new scheme called National Agricultural Insurance Scheme (NAIS). To implement this scheme, w.e.f. April 1, 2003, the Government designated Agriculture Insurance Company of India Ltd. (AIC), a public sector company, as its implementing agency. Further, another scheme, Weather Based Crop Insurance Scheme (WBCIS) was launched to cover the farmers in 20 states with a mandate to provide insurance against inconsistent climatic conditions (drought, flood, untimely rainfall, variations in temperature, frost, etc. )from the Kharif season 2007. With the purpose of insuring farmers, another attempt was made, when GoI introduced Modified National Agriculture Insurance Scheme (MNAIS) from the Rabi season 2010-11. The Scheme was launched on pilot basis in 50 districts of the country. Again, from the Rabi season 2013-14, the GoI started a new farmers’ insurance scheme – National Crop Insurance Programme (NCIP) through merging the MNAIS and WBCIS. But, on the request of the state governments, NAIS continued till the Rabi season 2015-16. Onwards the Kharif season 2016, the BJP government replaced NAIS and NCIP with the Pradhan Mantri Fasal Bima Yojana (PMFBY) and a restructuring of WBCIS was also made. So, the newly launched scheme, PMFBY, is just a continuation of earlier existing schemes with a few minor restructuring. The PMFBY – what is is there? 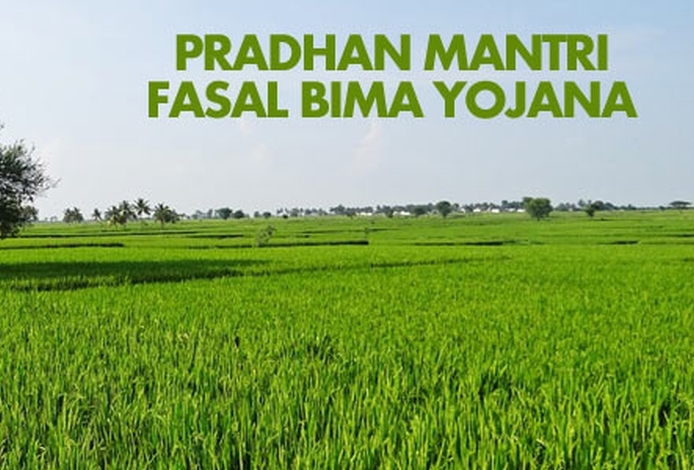 The PMFBY was started with the objective to insure farmers against crop yield losses. The yield loss for a particular crop would be calculated through the difference between threshold yield (average yield for last seven years) and actual yield for a crop in that season.The compensation would be fixed based on the above said difference (degree of risk) for a particular notified crop. 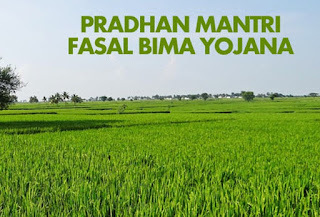 The PMFBY is compulsory to all the farmers who avail institutional loan (credit) – or to the farmers already having crop loan account/ Kisan Credit Card account (loanee farmers) to whom limit of credit is sanctioned/renewed for a particular crop. The Scheme also includes those farmers who are considered by the Government to be fit for insurance time to time. Apart from yield losses, the scheme insures against non-preventable risks, such as, lightening, storm, cyclone, hailstorm, typhoon, natural fire, tempest, hurricane, tornado, droughts, landslide, etc. So, if in a notified area, the insured farmers are intended to sow/plant a crop and have incurred expenditure, but due to bad/adverse weather conditions, farmers are not able to do so, in such cases, they are liable to get claims up to 25 percent of their total sum-insured. The scheme proposes that in a situation of post-harvest losses, the farmers would get insurance, if there is a crop loss (in the condition of cut and spread) within 14 days from harvest. To assess such losses from the above said risks, there is need to make proper records and digitization of the data on landholdings, area, production and yield. But, at the current juncture, neither well managed land records are available nor a highly mechanized remote sensing technology is being used in agriculture to collect information in the pre or post natural calamity or in a yield loss situation. Under these circumstances, when precariousness of information (data) is a concern, it is imperative to find how the PMFBY will work and provide a solution to the farmers, ailing under the long grown structural bottlenecks commonly understood as agrarian distress. The premium for the scheme under the Kharif crop, for a farmer, is 2 percent. For the Rabi crops and oil seed crops, the same is 1.5 percent while for commercial and horticultural crops, it is 5 percent. The remaining part of the premium is shared by the Central and State governments. The PMFBY, according to the data provided by the Ministry of Agriculture and Farmers’ Welfare (MoA&FW), insured only 33.8 percent of the total cultivators (numbers based on the Census 2011) in the Kharif season of 2016 and 21.9 percent of the total cultivators got benefits of the scheme for the same crop. But, if we ask the number of small and marginal farmers or the details of sharecroppers getting benefits of the scheme, the government fails to provide any such information. For the Kharif season 2017, the number and proportion of insured farmers had declined in comparison to the previous Kharif season of 2016. During the Rabi season of 2016, only 14.3 percent of the total cultivators were insured and 3.3 percent farmers got their insurance dues (Refer Table 1). So, coverage of the farmers under the PMFBY is very low in comparison to total number of cultivators in India. Also, the government fails to provide any data on the inclusion of marginal and small farmers as well as sharecroppers and tenant farmers under the scheme. The CAG report (2017) on Performance Audit of Agriculture Crop Insurance Schemes revealed that there were specific allocations of fund to cover Schedule Castes (SCs) and Schedule Tribes (STs) farmers, but data in terms of their coverage or use of fund for them is missing. Source: Ministry of Agriculture and Farmers’ Welfare, GoI. Note: 1. * indicates data from the Census 2011. 2. Figures within parentheses in Column 4 and 7 are percentages to the Total Cultivators. The gross cropped area (GCA) in India is 200.9 million hectares of which 37.8 million hectares (18.8 percent of the GCA) were insured in the Kharif season of 2016, but in the next Kharif season of 2017, the area insured had declined under the PMFBY. In the Rabi season of 2016, only 18.5 million hectares (9.2 percent of the GCA) were insured under the scheme. One may ask why the coverage of crop insurance schemes remain abysmally low even if they are being enforced from the last three decades.Likewise, the PMFBY, which is being advertised by the BJP government as one of the solutions of crop failures, is not able to cover majority of the farmers except a proportion of loanee farmers.Also, information on inclusion of the sharecroppers and tenant farmers – largely belonging to SCs, STs and middle castes is missing. Bansal et al. (2018), in their analytical report on NSSO survey on Land and Livestock Holdings, reported that in 2012-13, of the total cultivators in India, 15 percent were tenant farmers. They further elaborated that among all these tenant farmer households, SCs were 11.6 percent, STs – 8.1 percent, Muslims – 10.8 percent whereas others were 10.3 percent. These tenant farmers had hardly been insured, given, one of the conditions of loan, i.e. putting property (land) as security against agricultural loans, which in the case of tenancy of sharecropping, they hardly meet. So, one can fairly understand why the data on insured tenants and sharecroppers are missing – because if they do not own land, the banks would not provide them agricultural loan and they will not get insured under the PMFBY. Thus, the biggest drawback of the PMFBY is its designing itself. The target of the scheme is only the loanee farmers for whom it is mandatory. However, for the non-loanee farmers, it is not mandatory, and due to the reason their inclusion under the scheme is abysmally low.Further, the scheme insures, largely, the amount (loan) a farmer has taken from any commercial/regional bank for agricultural purposes. So in such a case, the scheme works as loan insurance instead of crop insurance. The CAG report (2017) on Performance Audit of Agriculture Crop Insurance Schemes revealed that most of the farmers do not have proper knowledge about crop insurance schemes. Also, the banks or insurance agencies do not make visible efforts towards making farmers aware about the same. For the periods, 2016 and 2017, which include two Kharif and two Rabi crops, total premiums paid by the farmers were Rs. 8716.5 crores; states’ premiums were Rs. 19409.8 crores whereas GoI contributed Rs. 16973.0 crores as crop insurance premium. So, the gross premium under the PMFBY was Rs. 45099.3 crores. The data provided by the MoA&FW shows that there are 18 insurance companies (including public and private), involved in crop insurance, paid the claims of Rs. 34780.2 crores leaving a loss of Rs. 12500 crores to the public i.e. a whopping profit of the equal amount went to these handful of companies(refer Table 3). The PMFBY, one of the most advertised schemes of the BJP government to provide relief to the farmers, was just a restructured one of the old crop insurance schemes. It could cover only 30 percent of the total cultivators and around 20 percent of the total cultivated area in India. This scheme largely covers loanee farmers whereas non-loanee farmers, tenants, sharecroppers are mostly left out. Neither the government nor the insurance companies provide data of insured cultivators belonging to the marginalized communities. These crop insurances are provided by both, public and private, insurance companies who have earned a whopping profit of more than Rs. 12500 crores in the last two years of implementation of the PMFBY. The lesser coverage (exclusion of cultivators) of the scheme is due to two reasons – first, being the techno-managerial reason – where banks and insurance companies show indifference and sluggishness towards the scheme itself. Second, due to long grown structural bottlenecks in agriculture, such as – lack of land records; absentee landlordism vis-à-vis high incidence of tenancy;high incidence of landlessness; unavailability of in time proper data assimilation on area, production and yield and overall stagnancy in public investment in agriculture. Also, the marginal and small cultivators hesitate to avail banking services due to various constraints, like, rigidness and difficult system of the banking system in providing loans. These structural constraints are also aggrandized due to the apathy of the political class towards agriculture where except the left political parties in India, almost all national and regional parties have reached to a consensus that agricultural sector would be taken care of by the market (read, the dependency on private insurance companies for crop insurance). Any such drive where policy intervention would be left for the market, without giving due attention to the structural constraints involved in Indian agriculture, will have lesser impact and will not provide solutions to distress ridden sector. Bansal, V., Y. Usami and V. Rawal (2018): Agricultural Tenancy in Contemporary India: An Analytical Report and A Compendium of Statistical Tables based on NSSO Surveys of Land and Livestock Holdings, Society for Social and Economic Research (SSER), New Delhi. Comptroller and Auditor General of India (CAG) (2017): Performance Audit of Agriculture Crop Insurance Schemes, Report No. 7, Ministry of Agriculture and Farmers’ Welfare. Ministry of Agriculture and Farmers’ Welfare (2017): Agricultural Statistics at a Glance, Government of India. Comments are subject to moderation. It may take some time to appear in the blog.